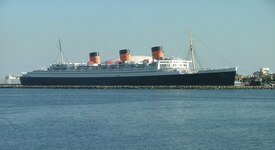 The ghosts of the Queen Mary are considered to be very intriguing to many individuals. This is especially true of those that seek to learn about the most haunted places in America. When it comes to the most haunted locations within the United States, the magnificent ship referred to as the Queen Mary ranks in at number six as far as popularity. This immense water vessel is located in Long Beach, which sits on the luxurious coast of California. Many call this location one of the scariest places on earth, while other refer to it as one of the most interesting. It all depends on how you feel about spending some time in a location that is known for its true ghost stories. The exceptionally large Queen Mary is often referred to as the "Gray Ghost". It is believed that several hundred different individual's souls haunt this water vessel. In addition to this, it is also believed that many of these hauntings are made possible by a large number of poltergeists. While it was once under the ownership of the British, the American people eventually purchased the large, mysterious ship. Today, the ship of a total of one thousand and one journeys now rests as an attraction to tourists in the visually attractive region of Long Beach. Once a beautiful ocean liner that sailed among the high seas, the water vessel is now a museum of the events of the past and the stories of the souls that have been left behind. Those that have observed the ghosts of the Queen Mary often come in contact with male spirits. These spirits are said to wear various types of suits that resemble those that were common during the 1930s. These spirits are typically only seen in the area of the ship that once accommodated those that traveled first class. In another area of the immense ship, a female spirit has been observed. This spirit is wearing a white, flowing gown and appears to be dancing. Many have witnessed various electrical components such as the lights and other electrically powered items turning on and then turning off – with no reasonable explanation. There is one location on the ship that is considered to be exceptionally haunted. This is the location identified as "Room B340". According to the history of the ship, a terrible and violent murder occurred in the room. As a result, it is believed that the room has a heightened level of paranormal based activity. There are many spirits that are believed to haunt this ship. The greatest mystery lies in sheer amount of ghosts that are believed to be a part of the "Gray Ghost". That number averages in at nearly six hundred. If you are interested in the greatest unsolved mysteries of the paranormal, this popular ship is sure to draw your interest!